Introducing: My New Project! Well, one of them at least. It's called The Great Books Reader: Excerpts and Essays on the Most Influential Books in Western Civilization and edited by John Mark Reynolds. Working in the book industry, I often get to discover great titles long before they come out and this was one of them. So I was eagerly anticipating the release of this book, and it ended up getting delayed by over two months. Frustrating. Now, for a little background on the book. It was compiled by John Mark Reynolds, founder and director of the Torrey Honors Institute, the Great Books program at Biola University in California. I tell ya, there's some universities I wish I could pick up and move here, and Biola is one of them. Then if tuition paid for itself, I'd be all set. This liberal arts and biblical studies program is like one of those far distant dreams that will never be realized. I didn't really know what to expect before I got the book. I didn't have a chance to preview it before I purchased it. Being a couple inches thick and weighing nearly three pounds, it's a good-sized book. It contains excerpts and essays on 30 different classics. It was designed for those who didn't have the opportunity to study at a university to be introduced to these works. People like me! And the best thing is, it examines these works in a Christian context. 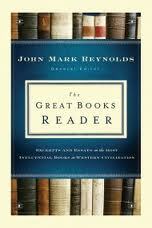 In his introduction, Reynolds explains why Christians should be well-read and how to approach the great books. He explains how to go about studying these excerpts and bringing the ideas in line with God's Word. I began by reading the selection of The Odyssey by Homer. After working on it for a couple days, I must admit, I didn't really "get the point." However, I wasn't ready to give up after that. Next was an excerpt of The Republic by Plato, which I'm still working on. Can I say WOW!!?? I got so excited reading it that I could hardly contain my joy. I think I'm still just in the beginning of this study. I'm pondering the meaning of justice, why people choose to be just, how we view justice or injustice and so forth. That may sound boring to you, but there really is something thrilling about reading a work from around 2500 years ago, understanding their view of the world and human nature, and realizing that a lot of ideas really haven't changed! It's incredibly inspiring! I have a lot of work ahead of me. In the coming months, I'll be diving into the likes of Augustine, Dante, Milton, Wesley, Shakespeare, Tolstoy, Chesterton and much more. Oh, then there's my other projects in between all that. I get excited about all this stuff. Yes, to get the full benefit, you have to do some tough thinking, but it is so rewarding.